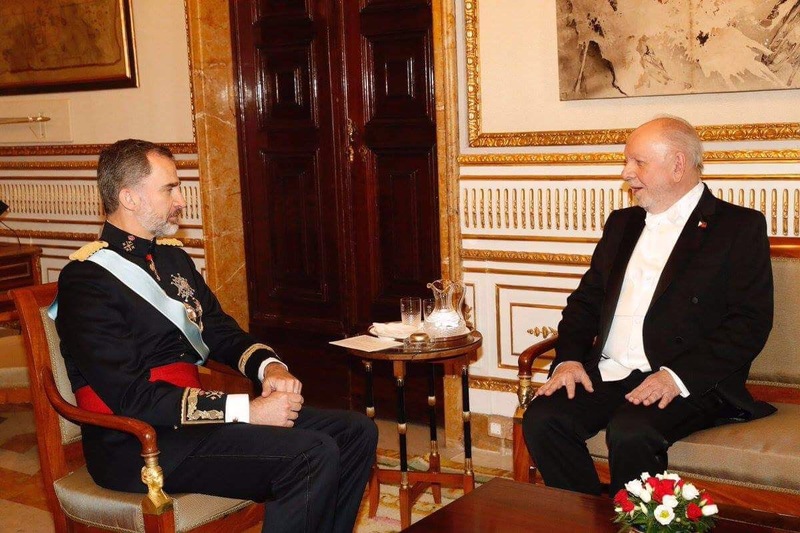 Ambassador Philippe J. Lhuillier presented his Credentials to the King of Spain (His Majesty, King Felipe VI) at the Palacio Real de Madrid last June 15. He was accompanied by the diplomatic officers of the Philippine Embassy in Madrid (namely, Minister and Consul General Emmanuel R. Fernandez; First Secretary and Consul Gerardo P. Abiog; First Secretary and Consul Mary Luck S. Hicarte; and Third Secretary and Vice Consul Ralf G. Roldan). 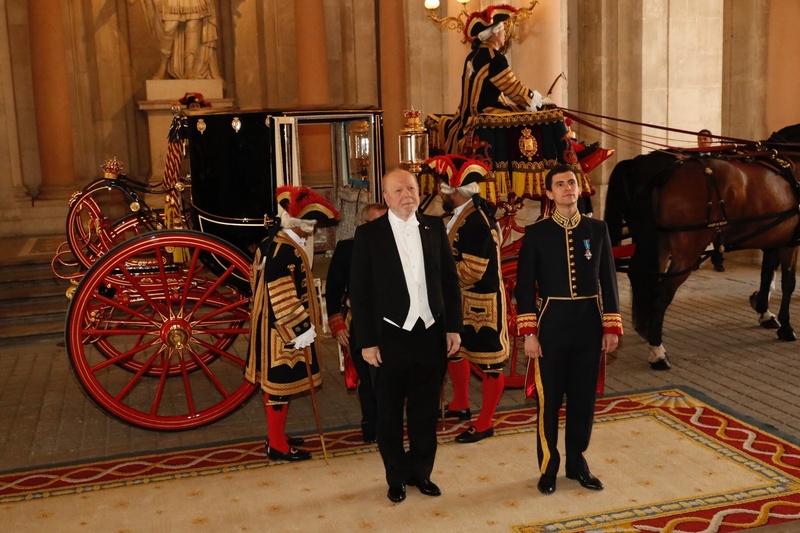 In his private audience with the King after presenting his Letter of Credence, he conveyed to His Majesty the Philippines’ desire to deepen its bilateral relations with Spain on all fronts (economic, political, cultural and people-to-people exchanges). He pointed out, however, that it is on the economic front that he intends to focus during his tenure as Ambassador to Spain. He expressed to him his intention to elevate the level of our bilateral trade by enhancing our two countries’ awareness of their respective investment/business potentials and providing as many opportunities as possible for Spanish and Filipino businessmen to engage one another. 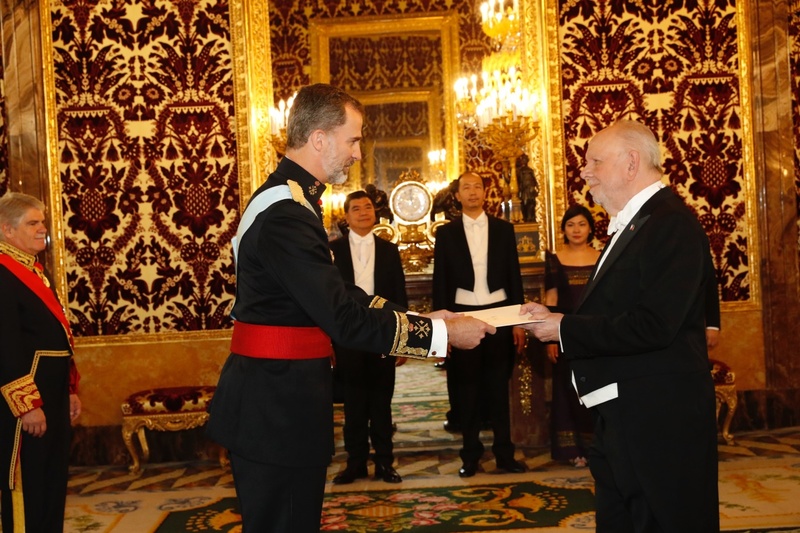 Ambassador Lhuillier also thanked His Majesty for Spain’s welcoming stance towards migrant workers, particularly, towards Filipino overseas workers. He expressed his appreciation for the mechanisms that Spanish labor law provides for the protection of the rights and welfare of migrant workers. Moreover, he also shared with the King the things he wishes to undertake to improve the lot of Filipinos in Spain, including his plan to establish a “Filipino Center” in Madrid (where Filipinos could avail not only of consular services but of many other services such as remittance, cargo shipments, purchase of Filipino food items and other products, etc.) as well as his desire to enhance the professional marketability of Filipinos by providing them with the opportunity to hone their language skill in Spanish. For His Majesty’s part, he said that the Philippines and its people continue to have a very special place in the heart of Spaniards. He said that he personally has a deep liking for Filipinos in Spain, whom he praised for their industriousness, their honesty, their admirable ability to quickly adapt to a new culture, language and environment; as well as for their famed facility in the English language. The King also welcomed the Philippines’ desire to deepen its bilateral relations with Spain and promised to do his best to contribute towards the achievement of that goal. When Ambassador Lhuillier told His Majesty that this year we are celebrating both the 70th anniversary of our bilateral relations with Spain, and the 15th anniversary of Filipino-Spanish Friendship Day, he commented that our historic ties have endured for a much longer time than that. We should count the lifespan of our relationship from the 16th century to the present time.